The night sky is a treasure trove of sights to explore. Tilt your head up and you will see so many interesting and amazing sights, you could easily spend hours observing them. If you are lucky enough to have a telescope, then these objects along with many more will reveal their true beauty. In fact there are so many interesting sights, you could be forgiven for losing track of time as you hunt across the sky. The success of your ‘star gazing’ will depend on how distant or how large the object is and the quality of your eyesight and telescope. A location away from pollution and glare from surrounding city lights will also make your viewing more enjoyable. The weather will obviously affect what you can see so too will the time of year. There will be times when the objects are closer to the Earth than they are at others, and so offer a closer view. So What Is Up There That Is Worth Looking At? In this two-part article, you will find a list of objects, both in our own galaxy and beyond for you to discover with your telescope. This first part looks at our own solar system and begins with our closest neighbor, the moon. While part two, moves beyond our solar system and identifies some of the more interesting distant objects for you to observe. Like most people, you have probably only seen the moon with your own eyes. When you look at it for the first time with your telescope you will be really amazed. Even with a basic telescope, it will take up nearly the whole field of view, making it seem close enough to reach out and touch. With a stronger eyepiece, the craters and mountains will jump out at you, giving you an amazingly detailed view of the topography of the lunar surface. Observing the moon over a month will allow you to watch it’s appearance change as you follow it’s phases. You will get a different view each night with certain nights showing just a thin sliver of illuminated surface. On some occasions you can experience “Earth Shine”, where the shaded portion is illuminated by sunlight reflecting off of the Earth. Other nights will present you with a full moon which can be so bright, that you may benefit from attaching a lunar filter to your telescope which will reduce glare, much like a pair of sunglasses. Looking through your telescope, especially at high power, you will notice the moon’s movement much more as it crosses the sky. You will initially point your telescope at the moon, but it will quickly move out of view. You will need to follow the moon with your telescope to continue looking at it. 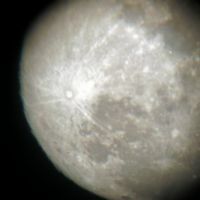 A motorized or computer controlled telescope can do this automatically for you, but is not necessary as you can still do it by hand. You may not think it, but you can look at the sun with a telescope. You do need to take precautions first however. You will need to attach a solar filter to your telescope or purchase a special solar telescope. These devices are designed to filter out the harmful light emitted by the sun to protect your eyes. But remember, you should AVOID LOOKING AT THE SUN without taking these precautions. When you do look at the sun, depending on your telescope, you may be able to make out details of its surface. You may see it burning away or even identify some sun spots and if you look at the right time may even be lucky enough to witness a solar flare. An interesting event to witness is an eclipse. There are two types of these that we can see frequently, lunar and solar. A lunar eclipse occurs when the Earth moves in between the sun and moon. The sun’s light is blocked by the Earth which casts a shadow across the moon’s surface. A lunar eclipse can be quite interesting to watch as the shadow can cover all (total eclipse) or a just a small part (partial eclipse) of the moon. When a large portion of the moon is covered, it may also turn a reddish, orange color. This is because the light from the sun is being filtered by the Earth’s atmosphere and is refracted onto the moon, turning it this color. A solar eclipse occurs when the moon passes in between the Earth and the sun, again, partially or completely obscuring it. You should AVOID LOOKING AT THE SUN without protection during this event as it can SEVERELY DAMAGE YOUR EYESIGHT. You can however, observe a solar eclipse with your telescope, but make sure that you have a SPECIAL SOLAR FILTER ATTACHED as this will block out the damaging sunlight. There are three types of solar eclipse: partial, annular and total. A partial eclipse occurs when the moon only covers a part of the sun, so that it looks like it has a bite taken out of it. 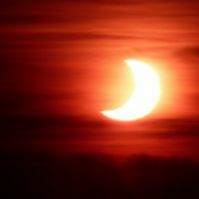 An annular solar eclipse is when the moon covers most, but not all of the sun. Because the orbit of the moon places it further away from the Earth, it appears smaller and does not cover the sun entirely. The sun appears to create a ring around the outside of the moon. A total solar eclipse occurs when the moon’s orbit positions it so that it appears the same size as the sun. The moon is then able to cover the sun entirely, revealing it’s corona. Looking at the planets with the naked eye, Venus is the easiest to see. It appears as a very bright ‘star’ in the sky due to its close proximity to Earth. 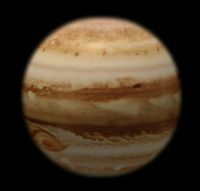 Jupiter will appear as a bright dot, but smaller than Venus. Under the right conditions, you may even be able to just make out some of it’s moons. Saturn will be a similarly sized dot thanks to its rings and may be slightly elongated. Mars will be a smaller reddish-orange dot and the remaining planets may or may not be visible, depending on conditions and your eyesight. Look at the planets through a telescope however, and a whole new world opens up, literally! You will be able to watch Mercury and Venus go through their phases, much like the moon, over several nights. Mars will appear as a small disc. It will still have the orange hue, but you should be able to make out some brownish splotches on the surface and when it is close to Earth, maybe even the white ice caps on the poles. Jupiter will be a lot larger, you will be able to see several of it’s moons and the cloud bands. Depending on your telescope, you may be able to make out the large red spot. Saturn’s rings will be clearly visible, depending on conditions, they may not appear as individual rings, but more like bumps protruding from the sides of the planet. You may even be able to see some of it’s moons. And if you are lucky, you may spy Neptune and Uranus which should be visible as small discs also. 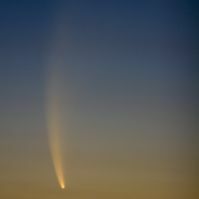 Comets are quite an amazing sight to witness. They are not that common, so if you are presented with the opportunity to see one, take it. They are easy to find, as they have a head or corona and usually a sometimes large, spectacular tail. Because their journey orbits the sun, the corona will be pointing in it’s direction and the tail away from it. Their size and distance will determine how easy they are to view. You may be able to see some without a telescope, but smaller more distant comets will be harder to see without one. Either way, a telescope will give you an interesting view of these spectacular cosmic travellers.